I want to use my registered copy of Babylon 7 Pro, including the additional professional dictionaries ?? ?Oxford Dictionary and Thesaurus?? ?, ?? ?Merriam-Webster’s Collegiate?? Dictionary and Thesaurus??? and ?? ?Britannica Encyclopedia??? on my new Dell laptop with MS Vista (and soon on Windows 7). This is not much to ask for you would think. Hey, I bought this stuff directly from the author of the software and paid good money for it. I entered all license keys yesterday and everything was fine. Today all keys are gone and except for one that unlocks one of the three additional dictionaries, none is working anymore. When I entered the codes again, I received the message that I must have made a typo or something. I didn?? ?t make a typo, thanks but no thanks. I went to their web site at Babylon.com I used the online form to retrieve license keys that they have created for this purpose I guess, enter the captcha code and my email address and submit the form. The form neither returned an error nor acknowledged the input telling me that new and valid license keys will be send to me again. Since I also did not get an email yet, I assume that it did not work as it was intended (hint: this implies another suggestion for the folks at Babylon). Their paranoia about software piracy disgusts me. I should get a pirated version of your software instead, because that one is at least working. *I am a user of the Babylon software since the mid 1990s. It used to be free for several years, when it was still in beta and I was using a cracked version when they first started to charge money for their software, without giving long time beta users a break to make the legitimate switch to the pro version. Up until version 4 they also had an Ad Ware supported version as an option, which was also free. I still have the setup files for their old version 3.2, 4.0, 5.0, 6, 7 and 7.5.2.10. The latter one is the version that I installed yesterday. I always supported them and recommended the software sincerely to friends and other people. I renewed my support once more, when I paid the full price for their PRO version in 2002 and bought upgrades and additional professional dictionaries over the years since. Now I won’t buy another upgrade to version 8 anymore, because I had have it with with their crap. I demanded (No, I did not ask nicely this time) that they are going to send me working license keys or better ONE license key for Babylon 7 Pro and the 3 pro dictionaries, which I paid them money for. This issue with their license keys and the way that they let legitimate customers jump through hoops before they will be able to use the software does not help to win customer loyalty nor sympathy. Users don’t have to put up with this, if they get the pirated version of the software. That means legitimate users get penalized for actually paying them money for a license over the ones who download the free pirated and cracked (fixed) one. Think about it. Which version would you prefer? The crack is an improvement of the software, a bug fix. This isn?? ?t the first time where this is the case. As a matter of fact, many crackers get started by removing faulty copy protections from software they legitimate purchased licenses for, but were unable to use it as they intended for one reason or another, be it a compatibility issue or a use of the software in a different way than the developer originally intended. Their paranoia does not help them to get more users to pay for their software. I would bet that the opposite is the case. At least they are not going to win any points with their paying customer base and decrease the likelihood that those existing users will recommend the software to friends and colleagues, not to mention becoming evangelists of it, as I used to be for them once.?? It?? ?s a great translation tool that can be extended with additional custom made dictionaries that are free and were created by other Babylon users over the years. 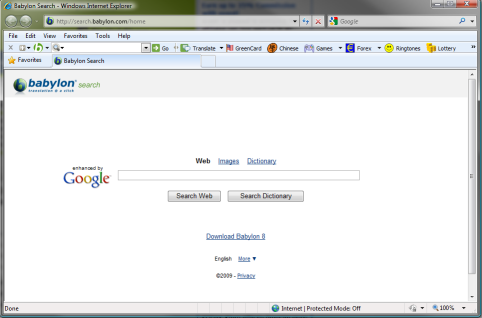 You can enable dictionaries to pull results from online or download them and install locally on your machine that you are able to use them, even if you are not connected to the Internet. The main problem that this software has is its copy protection. There is only one other thing, which does not really have to do with the main Babylon software itself, but with something else that they shovel down the throats of their customers without asking them, if they want to get it shoveled or not ??? After I installed Babylon Pro V7.X my Internet Explorer start pages suddenly looked like this. Who do think they think they are that they can install their stupid browser toolbar for Internet Explorer and change my home page to their own web site at ???http://search.babylon.com/home???? All that without asking for my permission of course. They did not ask for my permission during the install of Babylon (Version 7.x, sorry, but I didn’t buy a license for V8 so I don’t know, if they still do it or not). I also looked at the configuration screens for the software and did not see the option to disable your toolbar and/or change my default home page back to what it was. I have not checked yet, but I am sure that they also changed my default search provider to Babylon. This is not only arrogant and intrusive, but also unethical. They should at least have the decency to provide an easy way to remove it. Include the uninstall option in a ???Babylon??? folder in the start menu?? for example. There they only added a shortcut to?? the Babylon executable, without adding a separate folder. I?? ?d rather have them add a folder that includes the shortcut to start Babylon, Uninstall Babylon, Uninstall the Toolbar and maybe some other useful shortcuts as well, for example shortcuts to important sections of their web site; a link to the registration/purchase form, to the license recovery form, to their support page or to their directory of dictionaries etc. I thought at first that I have to go into the system registry manually to remove their Conduit Toolbar myself and by hand, because I didn’t see it in the control panel when I was looking for it there. When I found the registry entry for it (I used the very useful and FREE tool Autoruns by Mark Russinovich and Bryce Cogswell from SysInternals). There I noticed that they installed the toolbar into a separate folder below ?? ?Program Files??? (or ?? ?Program Files (x86)??? in MS Vista 64bit) titled “myBabylon_English” and not to a sub folder below their main program folder ???Babylon”. They also labeled it “MyBabylon Toolbar” in the add/remove programs section of the control panel (?? ?Programs and Features??? in Vista). Far away from the entry for the Babylon software at least on my computer which has hundreds of entries in that list. They should have called it “Babylon Toolbar” that it appears below “Babylon” in the control panel and put the files in a sub folder below “Babylon” in the Program Files folder where it belongs! This is not unreasonable to ask, isn?? ?t it??? Because of their blatant behavior, I am not even considering to use their toolbar and won’t even add ???http://search.babylon.com/home??? to my ?? ?Custom Search Providers???. [x] Install Babylon Browser Toolbar for MS Internet Explorer? ( ) No, I don't accept the terms of condition of Babylon. Don't install any of the items above. Then also add a screen to the Babylon configuration settings to change those settings again. To set the defaults options to ON during the setup wouldn’t be too nice either, but they would give users at least a chance to say explicitly NO, if they want to. If they really want to do it the nice and clean (in other words, the right way), then they would set the default options to OFF and provide some convincing arguments to the user why he should turn them ON. p.s. Now I removed the freaking toolbar via the control panel and guess what, it requires me to reboot my computer; great! That was not necessary to install it without my knowledge in the first place. I have not heard back from Babylon regarding my Customer Support request. I sent another message via their web form today. There I noticed something. I looked at my spam folder and got 3 messages there that coincide with the date and time when I used the contact form at the Babylon.com web site. So from what it seems, my contact emails never reached them. Also not my feedback email. I also tried the License Retrieval form on their site again, without success. This time I notice a message appear, which I did not see last time. 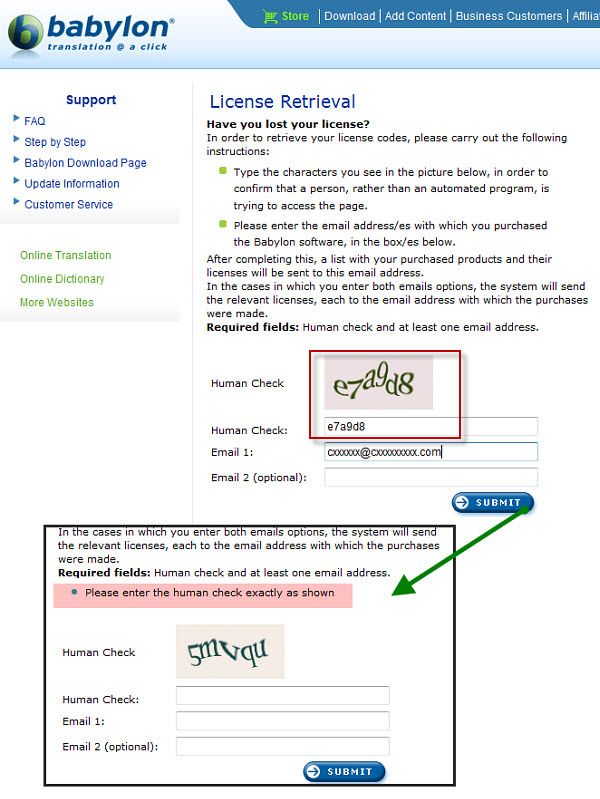 But that message also points to a bug with that form as well, or am I too stupid to enter a captcha code?! See for yourself and tell me, if I entered the wrong code or not. I found an old support email from where they responded to my emails a few years ago and which also worked to contact them. I sent a copy of my form message to that email address as well. It did not bounce or generated some other error so far, so keep your fingers crossed. Man, this is just unbelievable. I also sent an email to the addresses: [email protected], [email protected] and [email protected], which I found on their web site. Basically a request to forward the message to somebody who is responsible for all this stuff and a link to this blog post. Lets see if that does something. Maybe the company is out of business and they forgot to shut down the web site yet. Who knows. Anything could be possible. I will update this post again, once I got some news to report on this. I received an Email from the PR and Content Manager at Babylon on September 29, 2009 telling me that my email was forwarded to support and that I should hear from them within 48 hours. She also asked me for my phone number, which I provided in my reply. I tried to reach you today but there was no answer. As I said on the message that I left you will be happy to assist you with any technical problems you have encountered, but I will need more specific details. Assuming you have Babylon installed and running on your computer, please be more specific and explain exactly what happens when you try to use or install Babylon. Do you get any error messages? If so – what are they? Support was obviously not taking the time to read this post where I linked to from my email, nor did they find my contact attempts via their web contact form on September 23 and 28, 2009 (obviously). I provided my phone number. The contact attempt he refers to must be have been the call from a ?? ?private caller??? with blocked caller ID that I received that day, but not responded to. Bad enough, but worse is this: No response to my direct email that I replied with to this day. I received another email from a different support email account and person at Babylon.com on October 3, 2009, asking virtually the same as the other support person in the email from September 30, 2009. I responded on October 4, 2009 with another copy of my email to the first support rep and also CC?? ?ed that other rep in my response. Sent a second email to both support email accounts with my phone number to encourage them to call me again. Based on the times when they sent the emails to me, there is a good chance that they received my email today, before they left the office in Israel (where Babylon is located). The trial license to what the software switched to by itself on September 23, 2009, one day after I installed the software and applied my licenses to successfully expired by now also = The software does not run at all at this time anymore. There was actually an email from Babylon support that Microsoft flagged a possible Phishing scam and that I thus just saw today, when I checked that folder. The email was sent to me on October 4, 2009 and contained instructions to reinstall the software and new license keys that worked. Again a set of multiple user name and key pairs to unlock all dictionaries and Babylon itself. They obviously check license codes by having the application connect their servers when users are connected to the Internet (hello Privacy.. Microsoft would have been tarred and feathered for this), but okay they do that, fine, why isn?? ?t it possible then to just consolidate all my licenses into a single key and name that unlocks all of what I have licenses for at once? Why so complicated, if it could be done easy? I responded back to all support emails/reps that contacted me, to let them know that things are fine again (until next time) that they are not continue to try to fix something that isn?? ?t broken anymore. The left hand does obviously not know what the right hand is doing, so I thought that I will help a little bit with that communication and coordination ;). Until next year (I hope not, but I won?? ?t be too optimistic)! They work on the basis – paranoid as you say – that you are guilty until proved innocent, which is no easy task. I have not upgraded to version 8 having spent some $200 on the program and various dictionaries and will NEVER purchase anything from them again, or recommend them to anyone else. I now use Lingoes on my new Windows 7 installation, simply because I cannot face the the trauma of having my XP licences voided and having new ones issued. Thanks for the link and your comments. I voiced my opinion about the product via raiting it and writing a review on the CNET web site where you can download the trial version of Babylon V8. Here is the link to the download page with the reviews. p.s. I don’t even wanted to mention those pop-ups. Guess what, you get some of them as a licensed user too. They want your money to upgrade to their latest version of the software. Thanks, but no thanks. Looking at the version history of Babylon, things got most of the time worse instead of better with a new version. I greatly appreciate this blog, and the link left on ProZ.com that got me here. This software provider?? ?s behavior is in a league all of its own. Theirs is a bullying, intrusive and unjustifiable revocation policy that must affect masses of people. And somehow they manage to stifle what must be a huge number of complaints on this issue. I don?? ?t quite know how one leverages a search provider to have oneself filtered out of engine searches… but they obviously have this knowledge. You can find complaints about anything on the web… sparrows can complain about Babylon Birdseed Co. in Palookaville, Indiana… but you can?? ?t find complaints about these folks. There is no where to go. Nothing like talking directly to the customer. I won?? ?t bore myself by going through the details, but Babylon have managed to separate me from the use of one of my 2 lifetime licenses by a series of feints and hoops… It started with a sudden rush of unwelcome upgrade invitations at bootup. These shouldn?? ?t appear when you?? ?re a license-holder. But there?? ?s a new version for sale… They?? ?re just shakin the tree to see what falls out. It then turned into ?? ?a compliance issue???. (Was it that I wouldn?? ?t comply to buy an upgrade?) I asked them what the issue was. ?? ?To resolve this issue [that they invented]… do thus and so…??? So you oblige, and watch first your license number die, and then your software become totally un-reinstallable. They aren?? ?t answering emails any more. How I miss the ceaseless cold-sell popups at bootup that were the prelude to this vanishing act. You write and write, and send your info and licenses… and suddenly they?? ?re not interested at all… even though there is still a license they haven?? ?t unburdened you of… yet. It?? ?s good software… the worst user psychology I?? ?ve ever seen. People need some way of obtaining fair treatment. But ?? ?the Babylon.com user base exceeds 50 million desktop installations. Babylon sold more than 2 Million licenses of the software to private users and organizations in more than 200 countries.??? So they?? ?re not likely to have much time to fix issues, are they? Then I told the person to call me the next day (Friday between 7.30 and 8.30 AM). You know what happened : She called : Sunday, 6.30 AM!!!!!!!!! waking up the whole family. Thank you Babylon. Ok they are located in Israel but come on at least calculate the time difference right! I hang up after having passed my anger and told her to call me back the next day. You know what: she actually did but no apology nothing nada, not even a glimpse of sorry of what happened the day before. Again I explain the issue I am having and again she is trying to sell me something. She finally listened to me caught a few words “click” “mouse” and told me she will send me the instructions on how to change the mouse setting before hanging up!! !what’s the hell is wrong with them? I completely believe your experiences and agree to stay away from this company because they were completely incompetent with me in much the same way as described above. They have systematic problems. The objective of their support is quite clearly to get you on the phone in person so that they can sell you something. I purchased Speedlingua, which included a 3 month Babylon trial on the CD. It was ver 7; I saw that latestest was ver 8, with new features; the trial would not upgrade; online ver 8 had only 1 month trial. So on Dec 9, 2009, I wrote and asked if I could get a 3 month trial of ver 8. (I expected a no, but perhaps with a good upgrade offer.) They quickly rsponded on Dec 10th asking for my phone number, so I gave them my VOIP number. I did not hear back. I wrote back twice more with no response, then received a response to “please send me your license code and I’ll provide you with the solution to get working on your computer.” Wow, ok, great. So I responded 3 times with no response or unapplicable response from diferent people. Then finally, on Mar 11, 2010 they responded that they have tried to call me for a few days now (funny, they never left a message). They do not recognize Speedlingua, they do not have a 3 month trial for Babylon 7 or 8, and they cannot help me. The feature I wanted from ver 8 was “Full document transation (word, pdf, text)” advertised on their home page. I now see reviews that this mean copy and paste the text in to Babylon, not open the doc in B.
I will certainly NEVER buy anything from them.